The HMS Adventure is seeking crew. 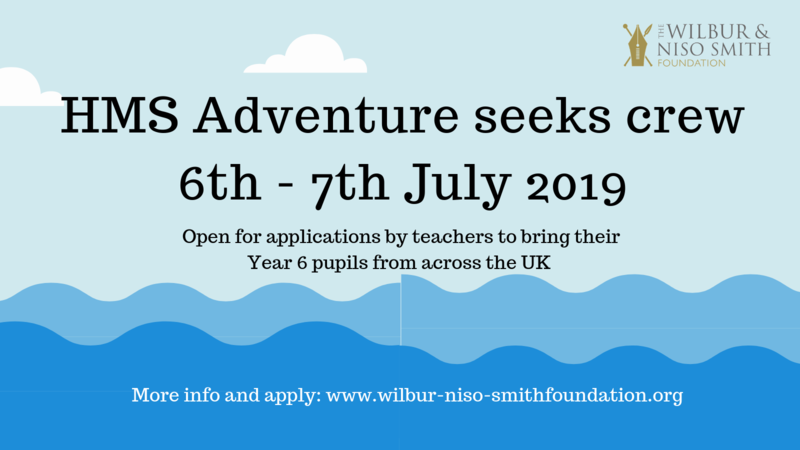 If you are a Year 6 teacher in the UK, we are inviting you and your pupils to apply to take part in the HMS Adventure. From 6th-7th July, we are inviting 46 young people and their teachers from across the UK to join the crew of the HMS Adventure for a weekend of sea-faring themed adventures. It will take you five minutes to create a free account and complete the required information. The participating groups will be chosen on a basis of need and spirit of adventure. Deadline for applications is 4pm on Monday 29th April 2019. Literacy is a key skill which leads to a better quality of life. In the UK, one in five young people leave primary school with a reading age lower than expected. We want to motivate these young people to start their own independent reading journey before they reach secondary school where the literacy gap often widens further. We will invite the participating teachers to identify the pupils they believe will benefit most. 10am onwards –participants are free to spend the day exploring the museum onboard the HMS Belfast with their teacher free of charge. We will cover the cost of the event for each participant: food, accommodation and activities for both teachers and pupils. For travel, each group will be able to apply for a travel bursar. This will be up to £700 for the groups of ten pupils, and £580 for the groups of eight pupils to cover both pupil and teacher travel. You will be responsible for booking and coordinating your own travel, which will be reimbursed with proof of purchase. As participants will be attending from across the country and we understand some will have higher costs for travel than others. We recommend keeping the costs as low as possible. If you have a funding gap, we may be able to offer additional support depending where each group is coming from. We take the safety of the young people we work with very seriously. A representative from the Foundation will be available at all times throughout the event. Once onboard the HMS Belfast, there will be staff members available at all times including a concierge who will be onboard overnight. Each teacher will be responsible for the participants they bring with them.